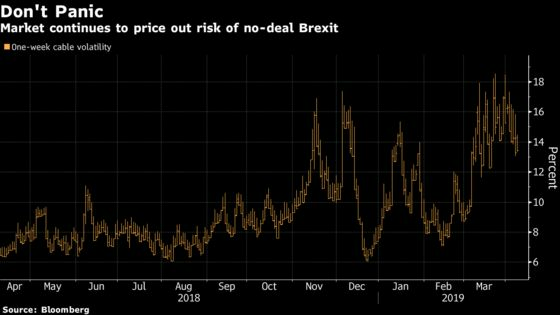 (Bloomberg) -- Pound traders appear undaunted by the lack of Brexit clarity even with just days left for Britain to officially leave the European Union. Sterling remains the best performer among Group-of-10 currencies this year even though Britain is in the grip of a political crisis, with Parliament deadlocked. This week, Prime Minister Theresa May is hoping EU leaders will give her another short extension to the Brexit deadline, until June 30, so she can carry on trying to get her plan through Parliament. However, the bloc could insist on a much longer delay. While the U.K. currency remains about 12 percent weaker than before the 2016 referendum, it has gained more than 2 percent this year and reached a nine-month high of $1.3381 in March. The pound could return to those levels if an extension is granted, according to a Bloomberg survey last month. Debate is set to resume Monday in the House of Lords on a draft law aimed at forcing the government to seek an extension to avoid a no-deal departure. The bill raced through the House of Commons in a single day on Wednesday but was held up in the House of Lords on Thursday. Investors will be watching the progress of the bill, with sterling likely to fall if the Lords reject it, Gallo said. Still, any such losses may be limited as the prime minister has all but ruled out a no-deal outcome, saying Sunday that Britain faces a choice between finding a new deal that can win a majority in Parliament and not leaving the EU at all.